If Ned doesn’t give his report on the common cold, Ms. Nosering will get her nose out of joint. But Ned has a head cold and his nose is running like never before. When it jumps off his face and runs through the school, he knows he’s in for it. 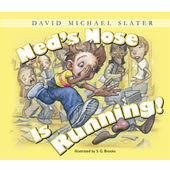 Can Ned stop his runny nose before he gets a failing grade?